Today, Alanna Renee nail polish launched her second polish collection called Magical World. The collection is inspired by the Harry Potter books and movies and consists of 12 polishes. On Saturday, Alanna was one of the ladies that I had lunch with, and when she offered bottles of her new collection, there was no way I was saying no! Now 12 polishes is a lot of polishes to swatch and show pictures of, especially when I have five photos of each shade. Therefore I've had to split them into three posts, each with four shades each. I'm starting with the four shades that seem to go with each other perfectly first. 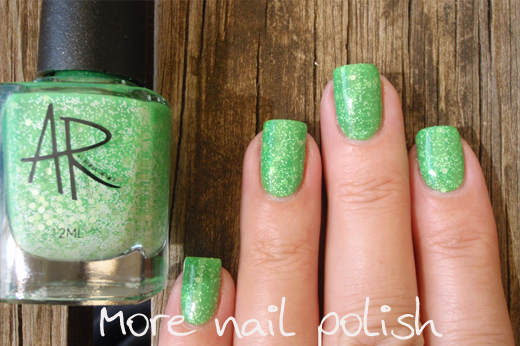 Avada Kedavra has a bright green jelly base with different sized white glitter. This is three coats with top coat taken in the sun. Alanna's swatch picture show this much brighter than my pictures show, but I think that is the difference of a light box compared to full sun photos. I love it when you can really see the inspiration of a polish become a reality. With this one for example, the Avada Kedavra spell has always been associated with a bright flash of green light. Butterbeer is an orange version of Avada Kedavra. 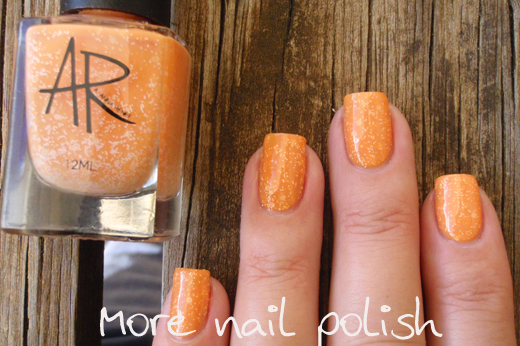 It has a mix of different sized white glitter in an orange base. This is three coats with top coat, taken in full sun. This was a really fun orange shade and actually looked pretty good one me :) Like the previous polish, I love how I can see the polish name and inspiration directly in the polish. For me this polish certainly conjures up the butterscotch flavour of Butterbeer. Stupify is the bright raspberry pink leaning red sister polish to the two above. It too has a mix of different sized white glitters in a red crelly base. This was three coats with top coat, taken in the full sun. Generally the Stupify spell is recoginsed by the flying red sparks from the wand, so I can certainly see the inspiration for this shade too. Hedwig is the last polish I have for you today. Hedwig has a mix of white, brown, black and yellow glitter in a white crelly base. I used three coats with top coat, taken outside with cloud cover. This polish has small white bar glitters, so if you hate bar glitter with a passion, you should stay away. I didn't have any issues with the bars, they behaved perfectly and really made this polish. The bars remind me of Hedwigs feathers, and the few yellow glitters remind me of his bright yellow eyes. The Alanna Renee Magical World collection went on sale today from her store at www.alannarenee.com for sale to Australian customers only. Polishes are $7.99 AUD - Fantastic value! Alanna Renee polishes are also available from Shoppe Electicco in Singapore and Color4nails in the USA, although this new collection will not be in stock until the distributors re stock. Ooooh, Butterbeer looks scrumptious! The glitters make me think of fizzy bubbbles :) Can't wait to see your swatches of the rest of the collection! Hedwig - I think that is beautiful - a lovely group of polishes. Ooh, these are so pretty and original! I hope they become available in the UK eventually!